In a release, the textiles ministry said post-GST rates of RoSL are up to a maximum of 1.70 per cent for cotton garments, 1.25 per cent for MMF, silk and woolen garments and 1.48 per cent for apparel of blends. The government has announced the post-GST rates for claiming rebate of state taxes under the scheme for Remission of State Levies (RoSL) on exports of readymade garments and made-ups, in a bid to support the outward shipments. The government has also doubled the rates for incentives under an export promotion scheme -- MEIS -- to 4 per cent for readymade garments and made-ups. In a series of tweets, Union Textiles Minister Smriti Irani said post-GST rates for remission of state levies/taxes and Enhanced Merchandise Exports from India Scheme (MEIS) rates will boost exports of garments and made-ups. The ministry said the notification of post-GST RoSL rates for rebate of state levies/taxes is in pursuance of the decision of the government to boost exports and employment generation in the labour intensive textiles and apparel sector. The Directorate General of Foreign Trade (DGFT) has enhanced rates for garments and made-ups to 4 per cent of value of exports from 2 per cent under MEIS. New MEIS rates are effective from November 1. "Announcement on post-GST rates of RoSL will be effective from 1 Oct 2017. Post-GST rates for remission of state levies/taxes will boost exports of garments & made-ups," Irani tweeted. In another tweet, the minister said the enhanced MEIS rates will further boost exports of garments and made-ups from India. Under the MEIS scheme, the commerce ministry gives duty benefits to several products. It provides duty benefits at 2 per cent, 3 per cent and 5 per cent depending upon the product and country. 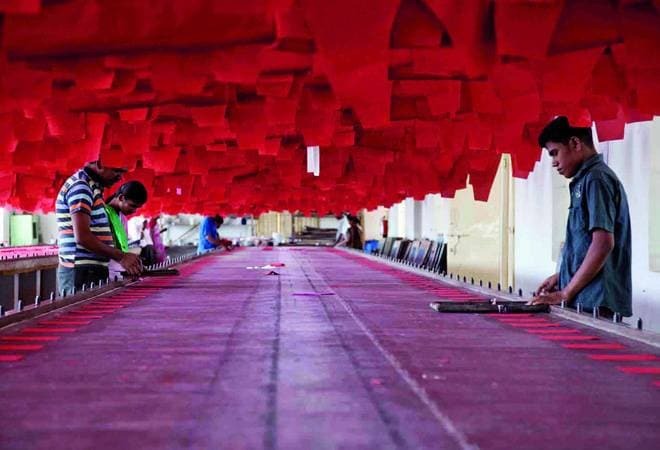 The DGFT said the rates for incentives under MEIS for two subsectors of textiles industry -- readymade garments and made-ups -- have been enhanced to 4 per cent of value of exports with effect from November 1 till June 30 next year. As a result, the estimated annual incentives will be Rs 1,143.15 crore for 2017-18 and Rs 685.89 crore for 2018-19, the commerce ministry said in a statement. Meanwhile, Several garment exporters' bodies from all over the country applauded the move. Commenting on the measures, H K L Magu, Vice Chairman of AEPC, said the garment exporters' body has been demanding the increase in rates of MEIS along with RoSL and duty drawback from a long time. AEPC said the increase in MEIS rates will help in the fulfilment of orders for the Christmas festival as it will help in unblocking the blocked capital. "We are also hopeful that the government will intervene and address the issue of restoration of the old duty drawback rates as the sharp reduction in the rates of duty drawback has dealt a huge blow on the competitiveness of the industry," he said. Tirupur Exporters' Association (TEA) also welcomed increase of the Merchandise Exports from India Scheme rates for Readymade garments and Madeup from two to four per cent for November 1 2017 to June 30 2018 period. He thanked Finance Minister Arun Jaitley, Textile Minister Smriti Irani and Commerce and Industry minister Suresh Prabhu "for crucial support at this hour of crisis." He also made a request to incorporate the embedded tax and announce the revised Rebate on State Levies and Duty Drawback rates as these were desperately needed to bring back exports' growth and boost confidence of garment exporters to take fresh orders and sustain themselves in global business. In another statement, Southern India Mills' Association Chairman P Nataraj also welcomed the announcement, which, he said, has given some relief to the industry. The government today announced post-GST rates for claiming rebate of state taxes under the scheme for Remission of State Levies (RoSL) on exports of readymade garments and made-ups, in a bid to support outward shipments.